Time: Day 1 - 2:30 p.m. - 6:00 p.m. ; Day 2 - 9:30 a.m. - 5:30 p.m. 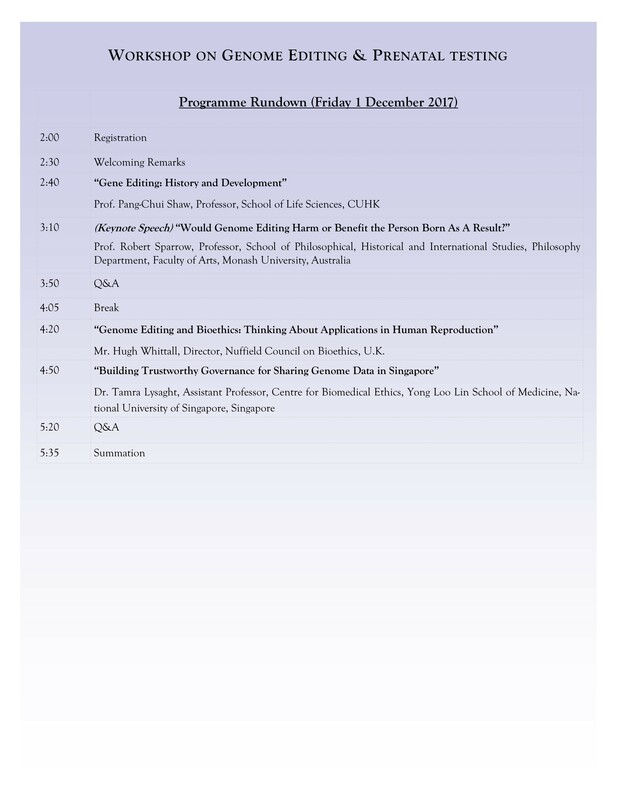 Presentation slides by Prof. Pang-Chui Shaw - "Gene Editing: History and Development"
Presentation slides by Prof. Robert Sparrow - “Would Genome Editing Harm or Benefit the Person Born As A Result?" 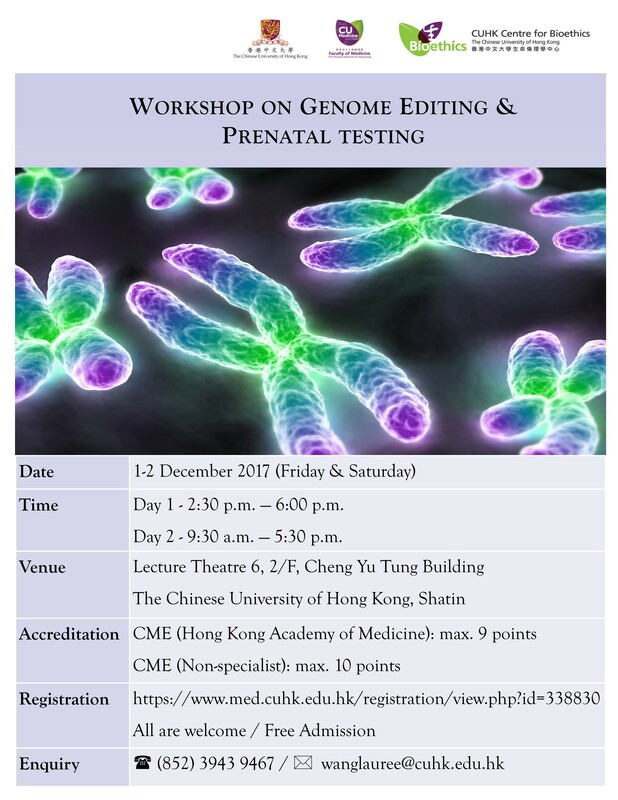 Presentation slides by Mr. Hugh Whittall - "Genome Editing and Bioethics: Thinking About Applications in Human Reproduction"
Presentation slides by Dr. Tamra Lysaght - "Building Trustworthy Governance for Sharing Genome Data in Singapore"
Presentation slides by Dr. Stephen Lam - "Current Practices and Ethical Issues of Reproductive Genetics"
Presentation slides by Prof. Ruipeng Lei - "Balancing Benefits and Burdens in Precision Medicine"
Presentation slides by Dr. Alexandre Erler - "Genome Editing at the Intersection of Prevention and Enhancement: Can Fixing Also Mean Optimizing?" 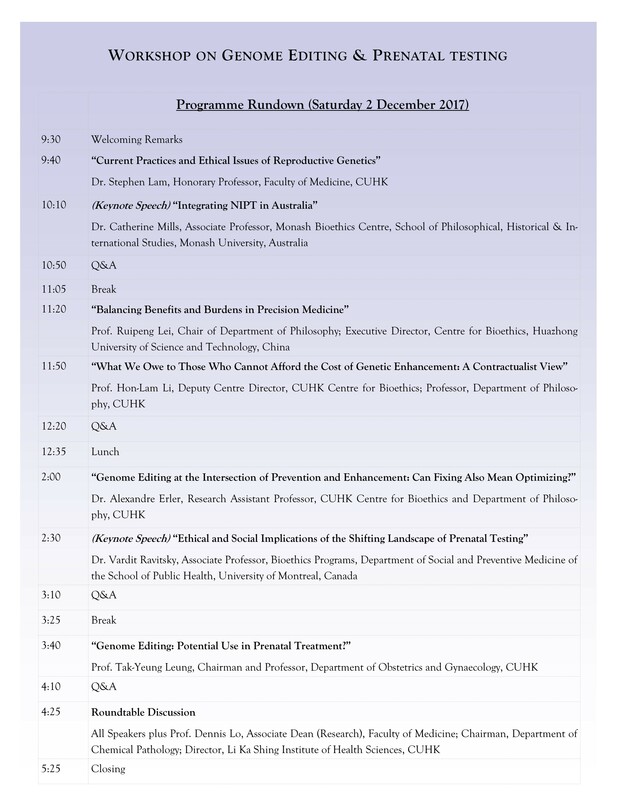 Presentation slides by Dr. Vardit Ravitsky - "Ethical and Social Implications of the Shifting Landscape of Prenatal Testing"